April yearling sales info now available. Two very important sales are coming up for us in April, and we’re inviting all interested parties to have a look at our sales pages to find out more about the stunning yearlings available at those events. First up is the Durbanville Sale which takes place on 13 & 14 April. We have five fillies and two colts on offer, made up of three Oratorio’s, two Var’s and one Philantropist and Master of my Fate respectively. Later in April, Pippa and her team will once again take on the long road north with 15 yearlings set for the National Yearling Sale at the TBA complex in Gauteng, which takes place on 24, 25 and 26 April. Here we have five fillies and 10 colts with a nice crop from our own sires, Var and Oratorio as well as some stunning yearlings by top stallions Captain Al (See pic of Gabriera – Captain Al x Miss Ipanema as a foal) and Dynasty. To make up the full group we have one Master of my Fate, one Twice Over and two Captains of All. For a private viewing and more info, contact Pippa at stud@avontuurestate.co.za. The first important 2018 Yearling event coming up for Avontuur is the Cape Premier Yearling Sale 2018 which takes place on 20 and 21 January at the CTICC in Cape Town. With five colts and five fillies lined up for the Sale, the Avontuur team is hopeful that this prestigious event will set the bar for the rest of 2018. More about each yearling in January! Oratorio’s return to health a huge relief! It was with a big sigh of relief that we announced the return to full health of our international stakes winner producing sire Oratorio recently. He was given the green light to commence full coverings after a bout of laminitis saw him out of action in September. A pleased Avontuur GM Pippa Mickleburgh said that she was very excited to have written to the Oratorio shareholders to inform them of the great news. Pippa extended an invitation to all breeders who were still finalising the covering season and said Avontuur will be happy to accommodate mares and assist where possible as Oratorio has some free slots in his schedule. With the KZN breeders stats featuring Oratorio 2nd from the top as reported on 15/11/17, it’s a good news story through and through. It’s been a stressful month for all at Avontuur as Oratorio was slowly but surely nursed back to health! But he has now shown an encouraging recovery from a bout of laminitis diagnosed last month, and commenced covering mares recently. A thrilled Avontuur GM Pippa Mickleburgh said that ‘O’, as the triple Gr1 winning son of Danehill is affectionately known, was ‘back on the job’ and looking, and obviously feeling, a lot better. 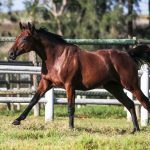 “The shock of his illness is now behind us and we are all pleased that the big guy is on the road to recovery – although he is confined to his box when not working and on a restricted diet. He is also under Veterinary and Farrier care,” said the relieved stud manager. Pippa confirmed that mares belonging to shareholders would be covered, and then only at the rate of one a day. “We are not putting him under any pressure. He covered Minelli, Val De Ra’s Mom yesterday, and is due to visit A Daughter’s Legacy, dam of classic contender Ancestry, tomorrow. We are thrilled as we were prepared to write this season off initially. We are just so thankful for the chance to get through some mares,” she added. Pippa said that Oratorio had shown the indomitable fighting spirit and heart of the top-class racehorse and sire that he is, in recovering from an illness that can prove fatal. He had also received world-class medical attention. She said that she was thankful for the support provided by their professionals. 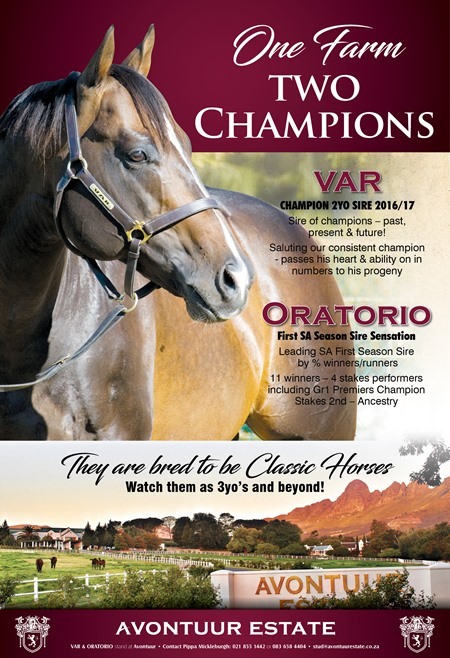 Var is Champion sire for 2 year olds! The first of August was an auspicious day for Avontuur Stud Farm as the great news arrived that Var is the SA Champion Sire of two year olds for the season 2016/17. As GM Pippa Mickleburgh says: “We have never ever had a stallion win this title on Avontuur before so it is a testament to everyone’s belief that our boy would eventually do it for us.” She also commented on the late owner, Tony Taberer’s confidence that the stallion would come through for the farm and SA, and that he had the foresight to purchase this incredible horse all those years ago. The cherry on top is that Avontuur’s second stallion Oratorio finished up as the leading first season sire on % winners to runners, which is an awesome start to the big O’s South African career after such an outstanding record overseas. We believe our two outstanding sires will keep on delivering the good stats and we wish everyone well for the next season. Avontuur sires in the running for top spots! The 2016-2017 season is fast drawing to a close in the Southern Hemisphere, and champion sires will soon be crowned. Both Var and Oratorio are in the running and we are holding thumbs for good results. Var has enjoyed a remarkable run with his 2yos and the son of Forest Wildcat looks on course to end Captain Al’s eight year reign. Var, whose juveniles have earned R2.45 million, has been represented by 20 individual juvenile winners thus far, headed by Gr2 Durban Golden Horseshoe winner, Purple Diamond, and Gr1 Tsogo Sun Gold Medallion runner up, Varallo. With two major 2yo races yet to be run, the first crop sires title appears to lie among What A Winter, Oratorio, and Twice Over. What A Winter is the leading first crop sire by stakes winners (3) and by prize money, with Oratorio and What A Winter being joint leading first crop sires by individual winners –the pair have eight apiece. Story courtesy of Sporting Post. Var and Oratorio start July off with a bang! What a fantastic weekend we had in Durban last weekend, with Purple Diamond (Var) and Ancestry (Oratorio) going head-to-head in the Golden Horseshoe and two Var’s coming in in fourth and fifth place respectively. This has led to Var now sitting at the top of 2yo sire’s lists which is always a thrill for any breeder. She’s a Giver ran a brilliant second to Bella Bella in the Gr 1 Garden Province Stakes and Chantyman did us proud as well! What a start to July 2017! July weekend looking good for Avontuur! The first weekend in July in South Africa is all about racing, stunning thoroughbreds, glamorous celebs and the general public enjoying the balmy winter weather in Durban. The TBA KZN Yearling Sale starts off the programme on Thursday the 29th, and this year there are five Oratorio’s and three Var’s in the catalogue which we are looking forward to supporting. With 2Yo Ancestry’s (Oratorio x A Daughter’s Legacy) win recently, and the ongoing excellent performances of the Var’s, this crop should keep the buyers lining up,” says Avontuur GM Pippa Mickleburgh. On Saturday 1 July the biggest race day in the country will take place and although Avontuur does not have a runner in the big one, we do have lots of interest in most of the action taking place. In the main race, our Avontuur-sponsored jockeys will be showing off their talent with MJ Byleveld on Master Sabina, Lyle Hewittson on French Navy for the in-form Tarry yard and Callan Murray jetting in from the East to steer last year’s winner, The Conglomerate for the Ramsden yard. In the Grade 2 Golden Horseshoe over 1400m we’re looking forward to seeing Ancestry up against Varallo and Varimas. In the 8th race it’s Isca, Our Destiny, Horse Guards, Varbration and Attenborough taking on each other, making this race of only 12 contestants, nearly half-filled with horses linked in some way with Avontuur. In the Grade 1 Garden Province Stakes over a mile, Avontuur-bred She’s a Giver will be strutting her stuff. All in all a full and exciting weekend ahead and we wish all the owners, breeders, jockeys, horses and punters a successful one! Caption: Ancestry as a yearling at Avontuur in the paddocks. See the video here of Ancestry’s incredible race! Oratorio is currently the second leading first season sire by % winners to runners at 25% with 8 winners from 11 races and a total Stakes of R829 925. Pippa referred to his many talented offspring waiting in the wings to strut their stuff and mentioned that there are five Oratorio’s on the KZN Yearling Sale coming up soon. “Although none of them are Avontuur-bred we look forward to seeing the results when Lot numbers 29, 133, 159, 224 and 259 appear in the ring. Personally I like Lot 29 Catharsis, as he is a half-brother to Gr 2 winner Hard Day’s Night as well as being from the family of Major Bluff, Silver Bluff and Key Castle, who are all multiple winners. Another good looking Oratorio is Carlita, Lot no 159, the only filly in the group. She is a classic filly with the pedigree to back it up, being from the female line of champion Argentinian filly Southern Spring. She should be a good purchase,” Pippa says. 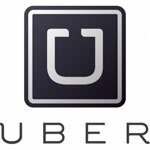 Oratorio still has some services available at R80 000, so do not be caught napping! Contact Pippa Mickleburgh at stud@avontuurestate.co.za for more info or to arrange a service. Former Zimbabwean and South African-based trainer Neil Bruss won Saturday’s Gr 1 SR250,000 King Abdulaziz Racetrack Champion Cup over 2000m on sand with the six-year-old Oratorio colt Gods Speed, who was ridden by Luis Morales. Jumping from gate 7 in a ten horse field, the Abdulelah Abdul Aziz Almousa-owned horse had cover throughout and travelled well. Morales made his move around the final turn and entering the 400m straight just had to overtake the pacemaker on his inside. The good looking bay then surged into the lead and managed to held on from the charging pair Smoking Sun (Smart Strike) and Ibn Alnafees (Premium Tap). Bruss’ latest stint in Saudi Arabia began last September and in 100 runs he has had 14 winners. The veteran trainer is an outstanding horseman and has successfully raided Dubai with his Saudi Arabian-trained horses before. In 2009 he sent out former Port Elizabeth horse Paris Perfect and the Argentinian-bred Muller to run third and fourth respectively in the Dubai World Cup. Oratorio currently stands at Avontuur Thoroughbred Farm in Stellenbosch. “Winning this race at 6 years old once again just proves the longevity of his offspring and bodes well for his supporters in South Africa too,” says Avontuur GM Pippa Mickleburgh.